Today is the first day of Poster class. I think I’m going to like this quarter very much. 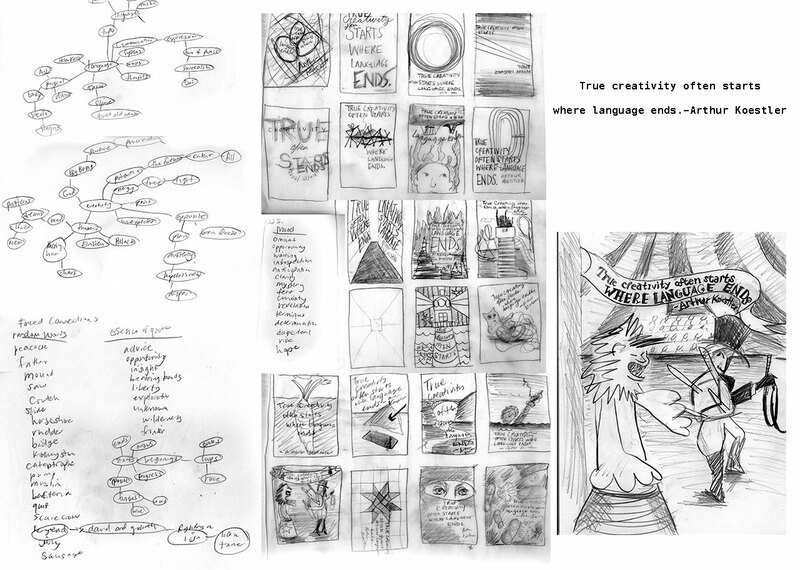 My class time was spent exploring brainstorming techniques and sketching out a poster featuring the quote “True creativity often starts where language ends” by Arthur Koestler (great writer, by the way, if you get a chance you should read Insight and Outlook). Jill went over some techniques of brainstorming. 1) Sketching symbols that capture the psychological state of subject (in this case, a quote) 2) Picture Associations– when drawing blanks, look to images (read: Google Image Search) and gather some inspiration and 3) Forced Connections– random words sometimes hold unique connections. What I thought was very valuable was the notion of 20-minute sprints. Jill said that we can’t concentrate very well after that, so it’s good to take a break, get some coffee, surf the internet, walk around a bit before getting back into it. I think it worked really well for me. 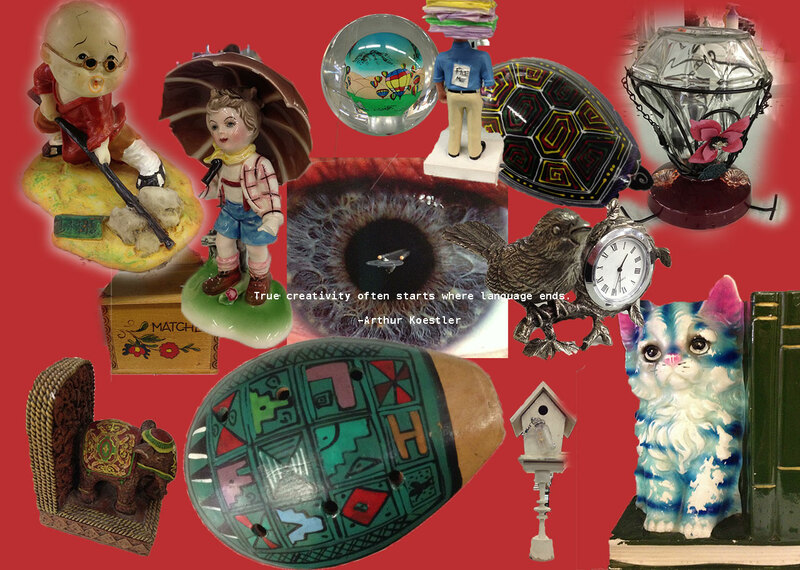 I went for a walk to a local thrift store and took some pictures of things that I found inspirational. There was a framed photograph of an iris with a starship at its pupil I wanted to have. Jill also talked about using a matrix to combine styles and mediums to get unique posters. Like doing a poster Dada style with mud as your medium. Etc. Endless fun, but I didn’t have time in class to really see what ideas that process could generate. I sketched out the lion tamer, but I really like this one item that I saw at the thrift store that seemed perfectly beyond language in essence that I wanted to make this poster. (I spent some time doing selections in Photoshop but I know I could have spent a little more to get the mask perfect.) Yes. 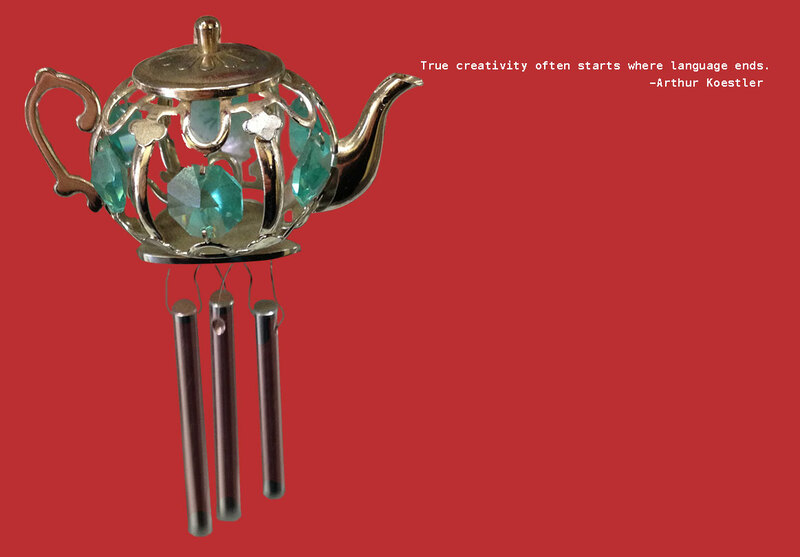 It’s a bejeweled teapot wind chime.